Barcode scanners have become commonplace important tools in retail. They speed processing time and thus can have an impact on customer experience in your store. But which barcode scanner is the right one for your store or retail business? The biggest factor is the use case. If you have a few small stores like I did, I used them at the POS, but not for inventory. When I ran larger organizations, we used the scanners for physical inventory which saved a lot of time. Scanners are only as good as the connectivity between the device and your POS database. In other words, you can buy the best scanner on the market, but if your POS system is not set to handle it, then it's a moot point. All POS systems will handle scanners for the cash register functions — this is the most common use case. In fact, the most popular POS systems come equipped with the barcode scanner in the box. But when it comes to warehouse or inventory functions, your system may not be ready. So check your current software's functionality before making a decision on which scanner to buy. 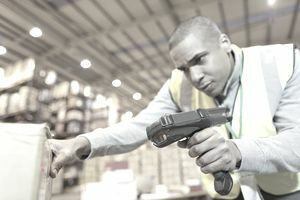 Here are the most common terms and considerations you need to consider as a retailer when deciding which barcode scanner to buy. There are three basic types of scanners. Each one reads different types of barcodes and labels in different ways. The most popular and well-known scanner is the laser. This scanner uses a laser and photosensor to measure the reflection of the lines in order to interpret the barcode it's scanning. It reads simple barcodes on a 1 dimension (1D) plane. It can read from two to 12 inches away, but there are some models that can read from 20 or more feet away. In fact, there is a Wasp barcode scanner that can read from over 35 feet away. These scanners are the most common due to their low cost. But they are limited in what they can do. And the laser diode will often time frustrate the user when trying to scan. These scanners can only read 1D images like the laser versions, but they do it very differently. As shared, the laser uses a red light and photosensor to read the black and white spaces in the label. The linear scanner actually takes a picture and then analyzes the picture. This speeds up the processing and scanning time. Since these scanners are analyzing a photograph instead of a reflection, it requires less light to operate. And this laser is much more forgiving of labels that have been tattered or torn during transit which is typical with barcodes. The prices for these models have become very similar to laser models. But the accuracy and quality of the scan are better making them a preferred choice. These are the best scanners because they can read any of the barcodes. As it sounds, it can read in a two-dimensional manner. This yields a lot of benefits. First, it allows you to scan in any orientation. With the scanner types, you have to align the scanner on the same plane as the label, but with the 2D scanner, you can read it portrait or landscape it doesn't matter. Some manufacturers will refer to this as omnidirectional. This scanner also takes pictures like the linear models and that's why many companies refer to their scanners as 2D linear scanners. The best feature of this scanner is that it can read barcodes off of any surface. For example, it can scan a label on a computer screen or printed directly on the equipment as opposed to just the adhesive label barcode. IF you have ever checked in at an airport with your mobile device, you have used this type of scanner. It's much harder to read barcode or QR code from an LCD screen which yields not reflection versus a paper label which does. Obviously, wireless is all the rage today. And we all love our mobile "untethered" lives. But there is a big cost difference between the two. Even though the scanner is categorized as wireless, it still has to be connected to a computer to work. So, the common application is to set a cradle next to the computer that can not only plug into the POS device for a connection but can also serve as a charging station for the scanner. This also means that your POS computer doesn't need any wireless device support. There are many scanners that can work through the "cloud" versus directly into the computer. These devices use ​Bluetooth to connect and can be linked to a mobile device as well. The app on the device gathers the information and then sends it to the server where the database for your POS system is stored. Often times, this is an online cloud server and not a "box" physically in the store. What we use most are handheld scanners. These can be either wired or wireless, but as their name implies they fit into the palm of your hand and point and shoot with ease. These scanners are designed to sit on the counter top at the cash wrap. They can be picked up and used as a handheld, but their screens are designed for you to "present" the barcode to the device versus the device to the barcode. The screens and readers are usually much larger than the handheld form factor which allows for a more forgiving scan and a wider scan radius. In other words, you do not have to be as precise with your aim on this scanner. Similar to the presentation scanner in that you hold the barcode to the scanner versus the scanner to the barcode, this scanner is usually mounted in the counter of the checkout stand. You have used these at your grocery store in the self-checkout lane. A fourth less common type is the mobile device. This is a computer just like your smartphone. It can scan and either store the information into its memory card to be downloaded later or even update directly via wi-fi or cellular connections. What types of barcodes are you reading? Considering the information shared earlier in this article, the types of barcodes you are dealing with will determine the right scanner for you. In other words, 1D or 2D codes. How often will you use the scanner? In my experience, investing in a deluxe model scanner when you only use it for physical inventory is not a good investment. Will it be used indoors or outdoors? This is important if you do shows or other outdoor retail. Scanners are not very durable in general. So, if you are traveling with it or using it outside, invest in one that can handle the elements. In Texas, for example, you need one that can handle the heat. How rugged does it need to be? There is a big jump in price when you get a ruggedized version, but the cost of replacing a scanner may make you want to consider one that is more durable. Consider the people using your scanners and the environment they will be used in. For general retail, it's not necessary to go rugged, but much like the indoor/outdoor consideration, if you are doing fairs or craft shows or street festivals, you will thank yourself for investing in this type of protection. What's the distance? While not as relevant to most retailers, how far away the barcode scanner can be from the barcode can be an issue. This mostly applies to warehouse applications. In other words, if you can be within one foot of the barcode, don't buy a scanner that can read from 20 feet away — it's not worth the extra money. Can you be connected directly to a computer? This is a big one. While all scanners have to be connected to a computer or tablet to function, if the scanner can be plugged directly into the computer, you can save yourself a lot of money. This is common with scanners at the POS.